Most days he assists customers at the N.C. Clampitt Hardware Store on Main Street in Bryson City. 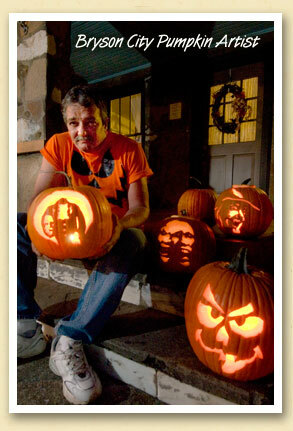 But come mid-October, Frank O’Neil is transformed into his alter-ego — the award-winning pumpkin artist. Above, Frank shows off four of his ‘ghastly’ jack-o-lanterns on the front porch of the Charleston Station gift shop.